The Mountain Skills Semester is designed from the cumulative experience of 40 years as Canada’s top mountaineering school. In our outdoor leadership training program, we have focused on the most important skills required to travel safely and confidently in the mountains. 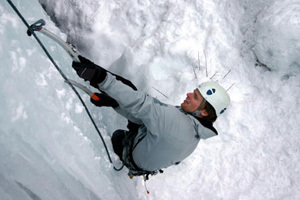 These skills are presented in a logical progression from basic safety protocols and mountaineering gear handling to intermediate and advanced techniques. The MSS program is almost entirely a hands-on technical skills outdoor and leadership training course in Canada. Unlike other similar gap year programs, over 90 percent of our outdoor leadership training program is spent outdoors learning the skills and techniques to make you a competent mountaineer and backcountry skier. We believe this is the most comprehensive mountaineering semester program in the world and is dedicated solely to developing mountain skills. Our mountaineering school does not focus on water sports or other non-mountain related disciplines. With these certifications and experience our students can go directly into working in the outdoor tourism and recreation industry. It is also a great starting place for further training and career-track for ACMG guiding certifications. In fact, many of our current guides and office staff are semester alumni. You will be issued an education tax credit receipt (T2202/A) and you can use your educations savings plan to pay for the course (please speak with your plan administrator). Your tax receipt will be for the instruction component of the semester and not the meals, accommodation or transportation costs. 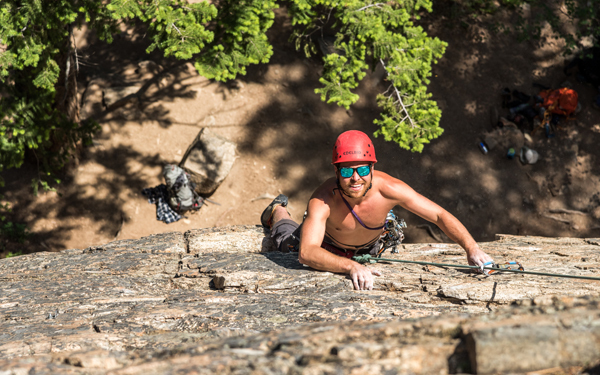 Yamnuska’s location in Canmore, Alberta Canada is prime for accessing some of the best rock climbing, ice climbing, backcountry skiing, and mountaineering that can be found anywhere in the world! Our guides and staff choose to live in this area because they are passionate about mountain sports and culture and they are the perfect ambassadors to induct you into this elite community. Most field sites are within a 1 – 2 hour drive of our office, so we get to spend more time in the wilderness and less time in a vehicle. All the Yamnuska mountaineering school guides are certified by the Association of Canadian Mountain Guides (ACMG) and recognized by the IFMGA. They are professionally trained to teach and mentor mountain skills and are selected for their ability to clearly convey the key skills in a fun and effective manner. We focus on the “hard skills” of mountain travel and safety and teach them in progression to form well rounded mountaineers. Many other competing programs have a more ‘soft adventure’ focus and teach numerous days of theoretical skills in a classroom setting. There are also many other semester programs that have a large water component which involve either marine or freshwater paddle sports. In our opinion, the most important skills for safe mountain travel are gained from actually being in the mountains and getting professional instruction. Building on this base, our students can progress to advanced technical mountaineering, skiing, and climbing objectives very quickly. As with most athletics, building this core of safety, knowledge, and fitness will help students in whichever other outdoor sports they choose to pursue. The reasons people take this gap year program and their backgrounds prior to entering the semester are very diverse but the common end result is a life changing experience. Many of our students tell us the sense of accomplishment they feel at the end of the semester is unlike anything they have ever experienced. The confidence that comes with this accomplishment lasts well beyond the three month semester and permeates into every aspect of day to day life after the program. ‘I just finished the assistant hiking guide course and exam – it was excellent, I learned a lot, from a bunch of great instructors and in an enthusiastic group ! I often thought about the Yam semester during the exam, it was an excellent base for that program. The navigation skills, the whole organising of food and camping setup, the chance to be in front of a group, the guides meetings including the “language” used for the weather obs etc, the wilderness first aid, the apprentice interpreter, to be moving around in the rockies for three months gave me ( especially as a foreigner ) the perfect base to get familiar with travelling in the wilderness and the “canadian standards”. Our semester students become like our extended family and we aim to offer you as much support as we can. Secure storage, internet access, travel arrangements, messaging services, and advice on local attractions and destinations are examples of the support you can expect from our team of professional administrative staff here at the office. We look forward to you joining our Canadian Mountain School! Don’t have time for the 3 month Semester? 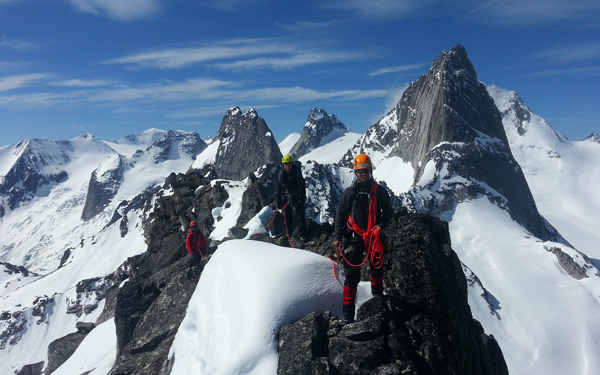 Check out our one-month mountaineering training course. Our mountain school curriculum is designed to make you a competent mountaineer. We believe this is best done in the mountains and not in a classroom or campus setting. 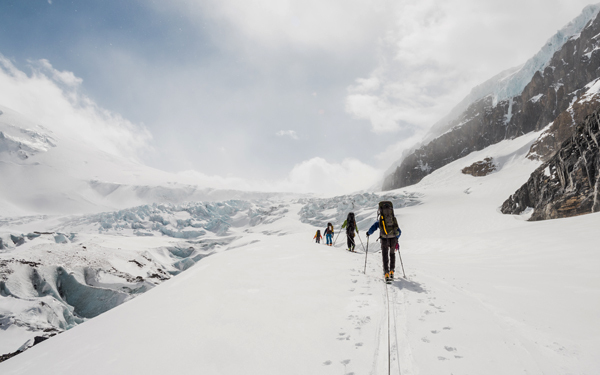 Leadership: Regardless of whether you are out with friends or if you are a guide, your leadership skills are an important ingredient of your success and safety in the mountains. Leadership development is an important part of the program and it is imbedded in all sections. Students will be put in leadership positions during every section of the semester. Backpacking & Adventure Hiking: Navigation and route finding in challenging terrain, river crossings and camping skills will all be covered during this section. We are also keen advocates of the Leave No Trace principal which will be introduced on this section and which will remain a constant thread throughout the semester. 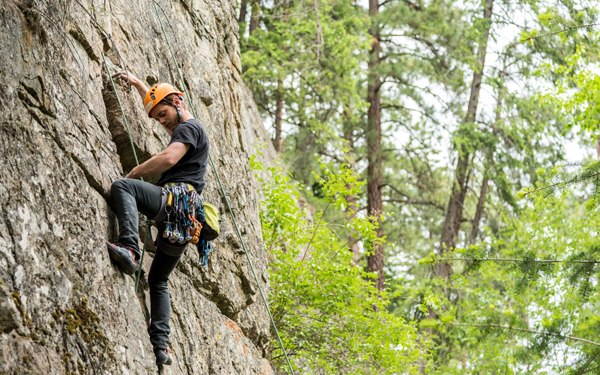 Rock Climbing: In the spring and fall rock climbing is taught at one of the best climbing venues in Canada:Banff National Park or Skaha, BC. 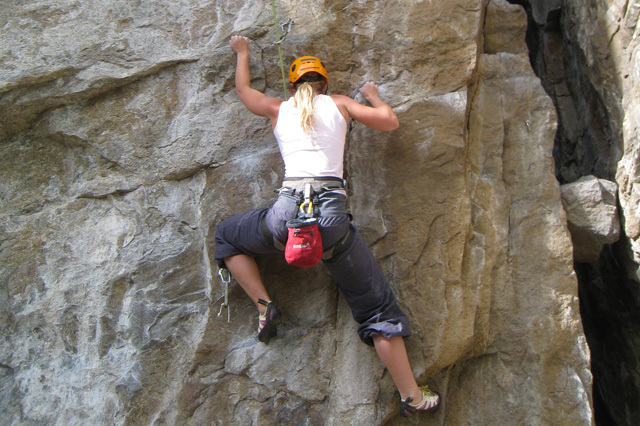 The huge variety of climbing makes both of these locations an ideal place to learn “sport” and “traditional” climbing techniques including leading and gear placements. 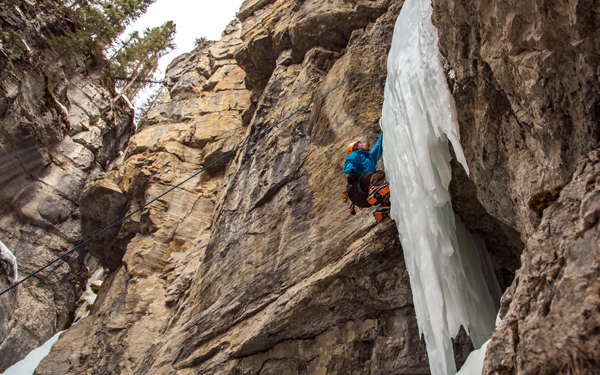 Ice Climbing: We have some of the best ice climbing in the world on our doorstep in Canmore. The Canadian Rockies are world renowned for their ice climbing and we will conduct much of the training in the heart of it near the Columbia Icefields. We will teach you how to move on steep ice using all of the specialized equipment, advanced climbing techniques and placing and removing ice protection. 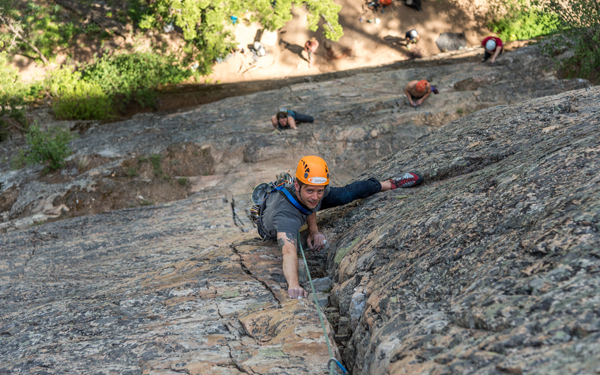 We will be covering “mixed climbing” and you’ll find ‘dry tooling’ a sure way to get you ‘pumped’. 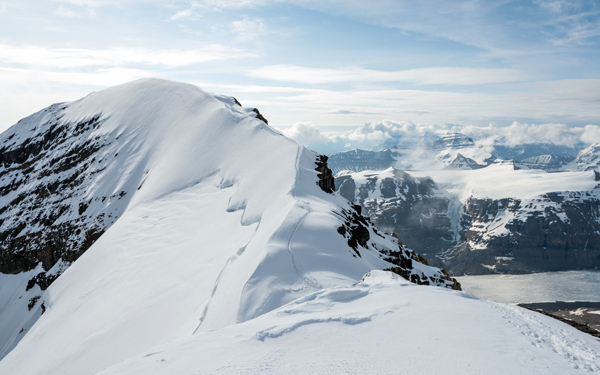 Mountaineering: Training takes place in some of the most remarkable terrain in the world. We teach you how to climb on snow, ice and alpine rock plus instruct you in glacier travel, crevasse rescue, route finding and navigation. All of this is combined with the ascent of several peaks. The final mountaineering expedition gives you the chance to organize and lead the trip under the watchful eye of our certified guides. 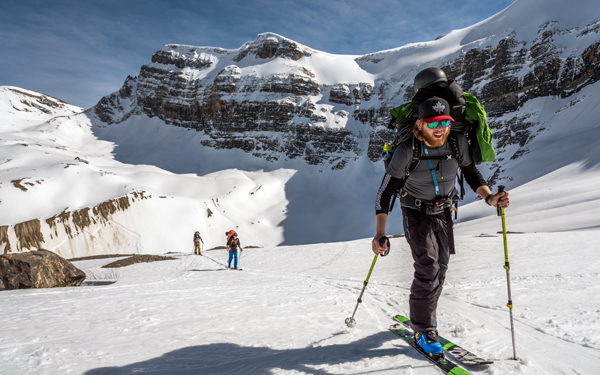 Backcountry Skiing: As with ice climbing we have world class backcountry skiing in the Canadian Rockies and in the Selkirk Range just to the west. Winter route finding, avalanche hazard assessment, glacier travel and winter camping skills are all covered. Canada is a world leader in avalanche training and Avalanche Canada sanctioned certificates will be awarded on successful completion. Rescue: We will introduce you to more rope rescue techniques and to the advanced skills needed to extract victims from remote settings and steep terrain. This is invaluable knowledge to have in the mountains. Wilderness First Responder: Part of the Semester is a professional level wilderness first aid course. The Wilderness First Responder Certificate course is run delivered by Rocky Mountain Adventure Medicine, North America’s leading provider of wilderness first aid training. This 80 hour program trains you to deal with the treatment and evacuation of casualties in a remote setting. You will be certified with the industry standard for outdoor professionals. For those looking to additionally use the certification for a worksite, the certification can be recognized by Alberta Workplace Health and Safety. This training will then offer mobility between Alberta, BC, Saskatchewan, Manitoba and the Yukon. To be eligible for this type of certification participants MUST provide proof of Standard First Aid certification that was taken within the year prior to the start of the Advanced Adventure Medic program. This is the exact same curriculum and exams, however the Standard First Aid pre-requisite must be met for recognition by the Alberta Workplace Health and Safety. Our introductory session for the semester will set the stage for travel in the mountains. This section will cover trip planning, navigational skills, map, compass and GPS. Food planning and preparation, Leave No Trace ethics, camping skills, cooking skills, group travel, hazard recognition and risk management, bear and predator awareness. The bonds that will last a lifetime are forged during this trip. The Apprentice Interpreter Course is a 2-day program that is designed for students who are relatively new to interpretive guiding. It gives a basic introduction to effective interpretation skills, local natural history, cultural history and park management. This course is perfect for getting an overview of the Canadian Rockies and learning about basic guiding techniques. This is one of only two sections that are in classroom instruction. All other sections of the semester are instructed outdoors. Successful completion of the two day IGA Apprentice Interpreter program combined with our MSS certification will result in an Interpretive Apprentice Hiking Guide certification recognized by Parks Canada and is a requirement for day hiking guides working in the National Parks. 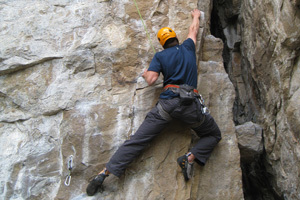 The rock climbing section covers the broad spectrum of climbing techniques. We start with the introductory skills of site safety, risk assessment, rope management, belaying, movement on rock and then progress as skills and confidence build. Over the duration of this section we will cover top-roped climbing, lead climbing, sport & Trad climbing, multi-pitch climbing, alpine scrambling and rock rescue. This is a comprehensive skills section that moves at the pace of the individual climber and builds on both beginner and intermediate skills alike. Taking our previous skills we move to vast and steep glaciated terrain. 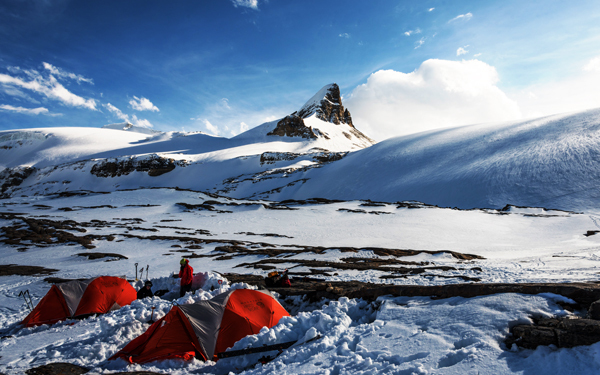 Our comprehensive skills section on alpine mountaineering is campsite based in view of the glaciers and peaks of the Columbia Icefields. 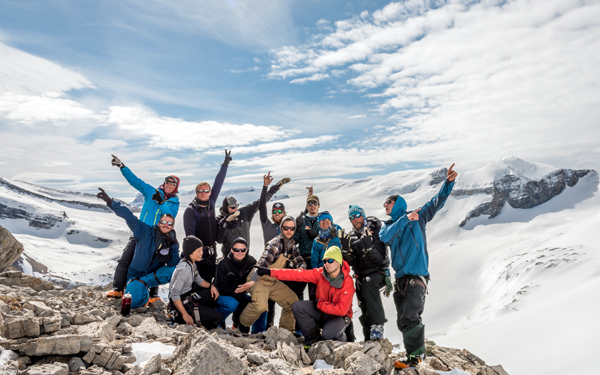 It is here that you will learn safe travel techniques and crevasse rescue skills on the largest icefields in Banff and Jasper National Park. Skills days will be interspersed with long mountaineering days on such objectives as Mt. Athabasca 3,474m and others. 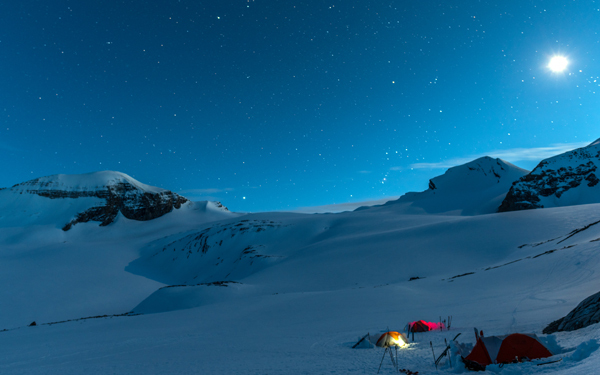 This is an opportunity to take the skills you acquired with the expert oversight of mountain guides to lead an expedition to one of the 11,000 ft. peaks of the Canadian Rockies. The Alpine Expedition is a group led trip interspersed with instruction, coaching and guide mentorship. This gives participants the chance to test skills and new knowledge in an expedition setting. This is one of the more challenging and rewarding trips and is the culminating trip of the Spring semester. This is an 80-hour theoretical and practical course on advanced wilderness first aid and medical emergencies. An industry standard course, our advanced adventure medic program is approved and recognized by the Association of Canadian Mountain Guides, American Mountain Guides Association, Sea Kayak Guides Alliance of BC and Alberta Workplace Health and Safety as the minimum requirement to progress into the outdoor recreation guiding profession. We schedule this section ‘mid-semester’ to provide a break in between physically challenging mountain trips. 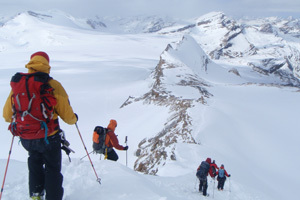 A two-day course based on curriculum developed by Avalanche Canada. One day in the classroom covering the theory behind the weather and avalanche phenomena, coupled with a practical touring day introducing the skills of snow pack analysis, companion and group rescue, terrain recognition skills as well as safe travel practice. This is the primary basis of traveling safely in the winter mountain environment and is a pre-requisite for professional avalanche training with Avalanche Canada. During the winter portion of the semester we will spend a day in Lake Louise or Banff at one of the ski hills tuning up ski skills with intensive coaching and practice. This day will help set the stage for the backcountry skiing portion of the semester. 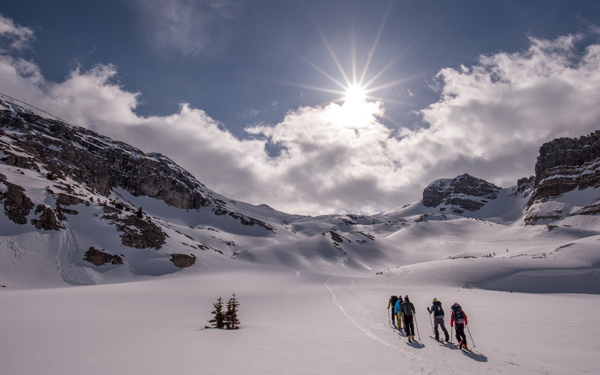 Our backcountry skiing and ski mountaineering sections are designed to provide students with the skills they need to travel safely in the winter mountain environment. 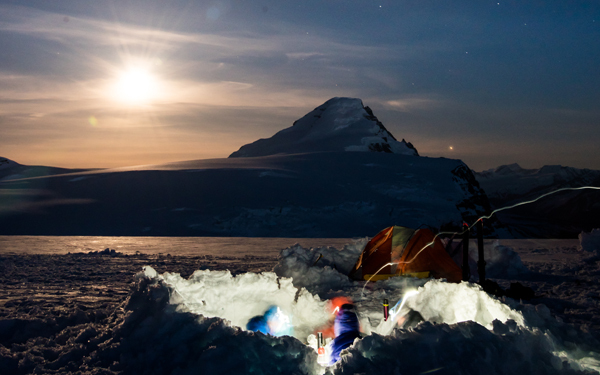 We cover the basic techniques required for winter camping and survival as well as the specific skills needed to safely traverse glaciers, ski mountaineer to climb peaks, and route find in avalanche terrain. Most students with intermediate skiing abilities can build their skills and progress on to ski instructor training at the end of this section. Our intent for this section is to allow the student to learn and use safe winter climbing practices in order to become a proficient climber on frozen waterfalls and in mixed terrain. 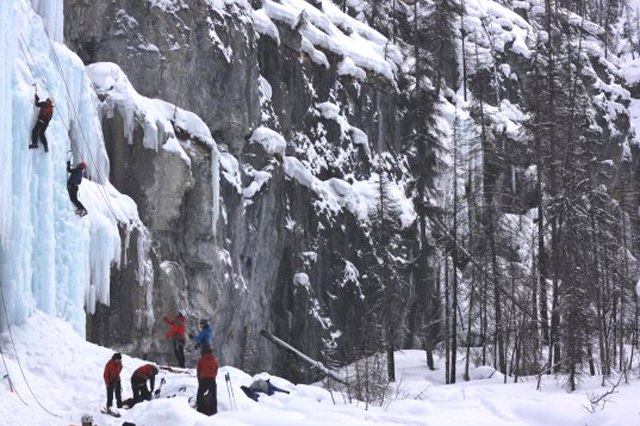 Many of the world’s best ice climbers have learned and progressed on the famous ice climbs of the Canadian Rockies. This section will introduce students to the technical skills required for top rope, lead and multi-pitch ice climbing in this world class area. Safe winter practices such as route finding, evaluating avalanche conditions and hazard management will be discussed. This is an excellent section in which students will progress according to their own comfort and physical ability levels. The Avalanche Skills Training 2 course takes place in Rogers Pass in the Selkirk Mountains. An area famous for its deep snowpack and world class backcountry skiing, Rogers Pass has the largest avalanche control program for highways and the railway in all of North America. This is an ideal location to learn about traveling in avalanche terrain and making the right decisions for personal and group safety. 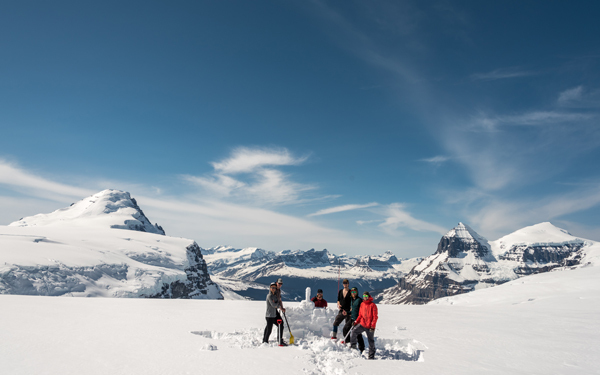 The primary focus of the trip will be on advanced avalanche awareness, however integral to the section is advanced backcountry ski techniques, ski travel, powder skiing, snow shelter building and winter camping skills. This is the culminating trip of the Fall semester. * Denotes a certification that the student will receive during the program which can be used for future employment in the Outdoor Recreation and Tourism field. Certification is subject to meeting the governing body standards. Day 1: The mountain skills semester will start at the Yamnuska office at 9.00am. We will get to know the group that we will be spending the semester with and review the objectives and agenda of the program. The afternoon will involve heading to the local ice climbing area for an introduction to crampon and ice axe use. Day 2-3: Two days of basic skills training near Canmore. We introduce movement skills on progressively steeper ice and start learning the rope safety techniques that we will apply throughout the program. Day 4: Based on the curriculum developed by Avalanche Canada the Avalanche Skills Training level 1 (AST 1) will be the base for avalanche risk management for the remaining winter sections of the MSS. This day will cover avalanche theory in the Yamnuska classroom. Day 5-11: Roadside seeps and frozen waterfalls have now become spectacular ice climbing challenges. For this section we base out of the Rampart creek hostel where we have numerous options for both ice and mixed climbing. The pace is stepped up to incorporate the skills required to lead and multi pitch climb. Mixed climbing skills will also be covered in this section. Day 13-14: The apprentice Interpreter course will provide an excellent understanding of your surroundings on the MSS. Successful completion of both the Semester and this course will give you the certification necessary to guide day hikes in the national park. This course is conducted by the Interpretive Guides Association and will be held in the Yamnuska classroom and is a pass/fail course. Day 15: Today will be spent at one of the local ski hills brushing up on downhill ski techniques and introducing safe skiing practices that can be used in the backcountry. Objectives will be adjusted for the groups ski ability. Day 16: The first day of backcountry skiing on the spring semester. Using the skills of the previous two days we will apply them to a backcountry day tour in the area. Student leads with coaching on track setting, route selection and hazard management will be some of the objectives of the day. Basic avalanche rescue skills will also be covered. Day 17-20: This is the first tent based section of the spring semester. 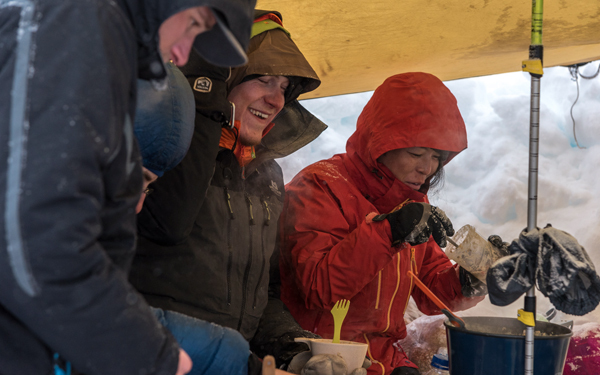 You will learn the skills of winter camping and cooking. The days will be spent completing the Avalanche Skills Training level 1 field components as well as beginning to refine route finding and track setting skills. Of course we will aim to ski some of the snow that makes these mountain ranges famous. The first day of this section is a prep day in Canmore where we will prepare food, tents, stoves and personal equipment. We will also cover ‘Leave no Trace’ practices, map and compass skills and trip planning. 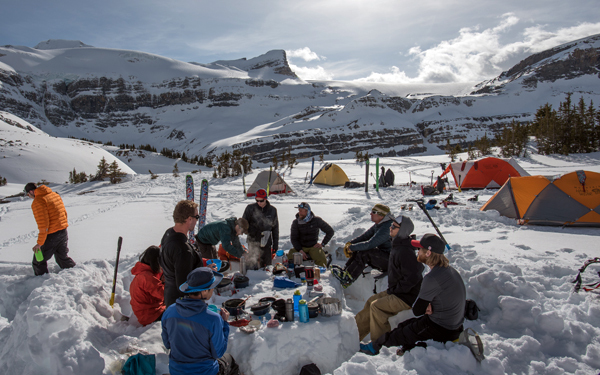 Expedition planning is a key skill that is covered throughout the semester and students will be expected to do most of the trip meal, equipment and route planning. Day 22-27: Based on Avalanche Canada’s curriculum, the Avalanche Skills Training level 2 course provides advanced avalanche training in complex terrain. This section is focused on improving avalanche skills to a high level as we head into the steep and deep of the Rockies or the Selkirk Mountains. We look at practical application of recognizing, evaluating and mitigating avalanche hazard. The group will either be camping or using snow shelters. With completion of this section you will be well prepared to continue with the professional level courses offered by Avalanche Canada or similar courses in other countries. Day one of this section will be a prep day and will also cover more avalanche related material in the classroom. Day 30-36: This section focuses on skiing in glaciated terrain. Instruction on glacier travel and crevasse rescue will progress into student lead climbs on the peaks of the Wapta Icefields. Refining winter camping and cooking skills will also be a goal. Day one of this section is a prep day. Day 38-47: This 80-hour professional level certification course is the bench mark first aid course for working in the outdoor industry. It includes extensive outdoor simulations and oxygen therapy. Those passing the exam are certified for three years. There will be a day’s break during the program which is needed for course study and exam preparation. This is a pass/fail course. Day 48-52: Your chance to take five days off and spend a little time on your own or plan a trip with some of your fellow group members. This is also a great time for keeners to go to the climbing gym to prepare for the next section. Many students plan their own mountain trips during the break to hone skills. Day 53-65: This is the longest segment of the spring Semester. As with the majority of the Mountain Skills Semester the rock climbing section is a hands on experience that will solidify your skills and knowledge. Having the basic technical skills from the ice climbing and ski mountaineering sections under our belts, we will quickly progress towards leading on both bolted and naturally protected routes. Multi pitch skills and rock rescue will also be an integral part of this section. Alpine rock scrambling will be covered and is an important facet of mountaineering that requires an ability to quickly choose the appropriate technique for every situation so as to maximize both speed and safety. We will introduce peer short roping, natural belays and other important alpine rock climbing techniques. 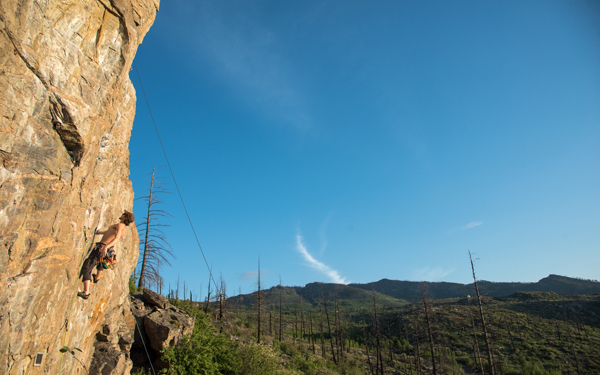 Rock climbing takes place in either the Rockies on a variety of types of stone or at Skaha in BC’s Okanagan Valley. A floating day off will be taken during the section and will be determined by the weather and student energy levels. Day 67-73: This is what the Canadian Rockies are famous for! 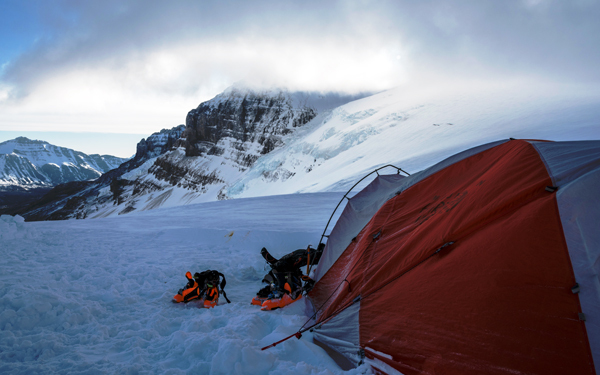 Instruction on glacier travel and advanced crevasse rescue will progress into student lead climbs on the peaks of the Columbia Icefields area. Skills for climbing multi pitch alpine ice routes will also be covered. Day 76-81: As a group you will face the challenges of traveling and climbing in a new alpine region and putting to use the skills you have learned over the previous months. It is also a celebration of three months spent in the mountains. Areas used in the past have been: Mt Columbia, Ghost Valley Area, Mt Joffre, Mt Brazeau, Roger’s Pass and others. Day one of this section will be a prep day. Day 82: Individual interviews with the instructors to properly debrief the program and an opportunity to plan how to further develop your mountaineering skills and career. This will be followed by a celebratory graduation dinner where you will be congratulated and awarded your certificates from the program. Day 83: The course is closed and students head their separate ways after a great semester experience. The friendships and bonds formed will no doubt last a lifetime. Day 1: The mountain skills semester will start at the Yamnuska office at 9.00am. We will get to know the group that we will be spending the semester with and review the objectives and agenda of the program. The afternoon will involve preparing food, tents, stoves and personal equipment for the first section. We will also cover ‘Leave no Trace’ practices. Day 2 – 5: The first day of this section will build a solid foundation in mountain navigation before beginning our four day hike. The majority of our hike will be off trail to provide the best adventure and test for your navigation skills. Day 7 – 21: This is the longest segment of the fall Semester. As with the majority of the Mountain Skills Semester (MSS) the rock climbing section is a hands on experience that will solidify your skills and knowledge. We will start from the basics of equipment familiarization, belaying and movement technique and progress to leading on both bolted and naturally protected routes. Alpine rock scrambling will also be covered and is an important facet of mountaineering that requires an ability to quickly choose the appropriate technique for every situation so as to maximize both speed and safety. We will introduce peer short roping, natural belays and other important alpine rock climbing techniques. Two days on this program may be spent indoors at a climbing gym. These days are designed to prepare students for the Climbing Gym Instructor’s course. They will be focused on indoor climbing techniques and learning to teach basic climbing skills indoors. 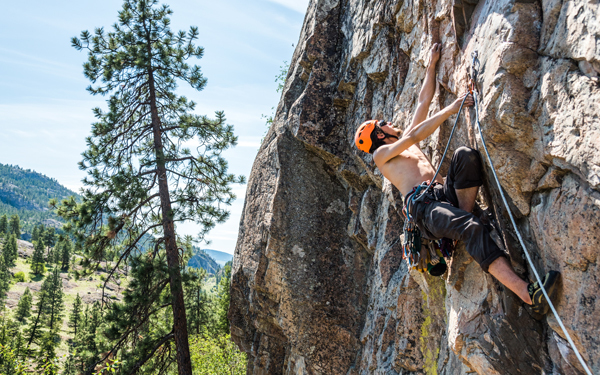 Rock climbing takes place in either the Rockies on a variety of types of stone or at Skaha in BC’s Okanagan Valley depending on weather conditions. A floating day off will be taken during the section and will be determined by the weather and energy levels. Day 24 – 25: The apprentice Interpreter course will provide an excellent understanding of your surroundings on the MSS. Successful completion of both the Semester and this course will give you the certification necessary to guide day hikes in the national park. This course is conducted by the Interpretive Guides Association and will be held in the Yamnuska classroom and is a pass/fail course. What the Canadian Rockies are famous for! Instruction on glacier travel and crevasse rescue will progress into student lead climbs on the peaks of the Columbia Icefields area. Skills for climbing multi pitch alpine ice routes will also be covered. Day 35-40: As a group you will face the challenges of traveling and climbing in a new alpine region and putting to use the skills you have learnt over the previous weeks. This trip is student lead with coaching and feedback from your guides. The first day of this section will be a prep day for the trip. Areas used in the past have been: Mt Joffre area, Freshfields area, Mt Forbes, Mt Brazeau as well as others. Day 42-51: This 80-hour professional level certification course is the bench mark first aid course for working in the outdoor industry. It includes extensive outdoor simulations and oxygen therapy. Those passing the exam are certified for three years. There will be a day’s break during the program which is intended for course study. Day 52-56: Your chance to take five days off and spend a little time on your own or plan a trip with some of your fellow group members. Day 57-58: Based on the curriculum developed by Avalanche Canada the Avalanche Skills Training level 1 (AST1) will be the base for avalanche risk management for the remaining winter sections of the MSS. The first day will be theory in the Yamnuska classroom and second day is hands on in the field. Day 59: Today will be spent at one of the local ski hills brushing up on downhill ski techniques and introducing safe skiing practices that can be used in the backcountry. Objectives will be adjusted for the groups ski ability. Day 60-66: Adapting previously learned glacier travel skills into the winter ski setting will be the main goal of this section. The huts on the Wapta Icefields north of Lake Louise are the typical venue for this trip. Day one of this section is a prep day. Day 68 – 74: Waterfall ice climbing has a different ambiance and feel from the climbing we’ve done up to this point. Roadside seeps and frozen waterfalls suddenly become spectacular climbing challenges. For this section we base out of the Rampart creek hostel where we have numerous options for both ice and mixed climbing. We spend the first couple of days learning and refining the basic skills used for climbing this unique medium and then the pace is stepped up to the skills of leading and multi pitch climbing. Day 76-81: This is the final section of the fall semester. Based on Avalanche Canada’s curriculum, the Avalanche Skills Training level 2 course provides advanced training in complex terrain. This section is focused on improving avalanche skills to a high level as we head into the steep and deep of the Rockies or the Selkirk Mountains. 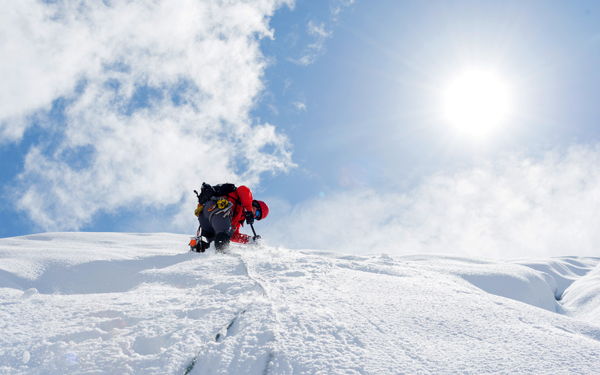 We look at practical application of recognizing, evaluating and avoiding avalanche hazard. The group will either be camping or using snow shelters. With completion of this section you will be well prepared to continue with the professional level courses offered by Avalanche Canada or similar courses in other countries. Day one of this section will be a prep day and will cover more avalanche related material in the classroom. Day 83: The course is closed and students head their ways after a great semester experience. The Yamnuska Mountain School is based in Canmore, Alberta, Canada in the Front Range of the Rocky Mountains just minutes from Banff National Park. Section locations vary according to conditions but we typically range north to the Columbia Icefields, west to Rogers Pass in the Selkirk Mountains and east along the edge of the Rockies in Kananaskis Country. Most program locations are within an hour’s drive of our office which means more time spent in the mountains. Canmore is a vibrant mountain community with lots of great local flavour and community events. It is also a Mecca for the outdoor recreation enthusiast with the possibility of participating in most any mountain sport that you can imagine, from paragliding, to white-water kayaking and of course mountain biking! Located just on hour West of the city of Calgary, living in the mountains doesn’t mean isolation from modern conveniences like an international airport and a city full of major shows, events, and sports teams. And as the eastern border of the massive Mountain National Parks system, the abundance of nature and wildlife viewing opportunities is unmatched! Please plan on arriving in Canmore at least the day before the Semester begins. At an elevation of around 1,300m, most people do not suffer any effects from the higher elevation, however it is nice to have a few days to get your bearings before we begin the program. During the program all transportation is supplied in modern 12 – 15 passenger vans. You are welcome to bring your own vehicles, however for most program components it is best to drive with the group to the daily training locations. During evenings, on free days, and during the course break, transportation is not supplied. The instructor ratio (number of students per instructor) has a very large impact on the quality of the program. Ratios are selected based upon the difficulty and hazard associated with the teaching terrain. On most sections the ratio is 1:6 which is fine for single pitch climbing, general mountain, and ski mountaineering terrain. On multi-pitch climbs and for the advanced alpine mountaineering sections, the ratio will drop to 1:2. Accommodation is mixed throughout the course. During much of the Semester you will be out in the mountains camping, staying in mountain huts, hostels and even snow caving. Between trips we will be based out of Canmore, Alberta and accommodation is not included. There will be approximately 40 nights where we will be based in Canmore and we can arrange budget hostel or hotel shared accommodation (with other MSS students) for these “in-town” nights for an additional cost. We offer an option with fully equipped kitchens and lounge areas. Subject to availability. Fall 2018: $1980 – Based at the Rocky Mountain Ski Lodge: the lodge is based approximately 500 metres from the closest grocery/food store so you should have access to a vehicle or be prepared for a short walk to downtown. Spring 2019: $1760 – Based at the Alpine Club of Canada Canmore Clubhouse: The Alpine Club of Canada offers a great venue just minutes from downtown Canmore in the beautiful Canadian Rockies. Dietary Restrictions – PLEASE NOTE: Our kitchen and full-time chef can accommodate many different kinds of dietary restrictions, allergies, and food preferences. For those with specific menu requirements that need supplemental food items or individual pack-outs there is a food surcharge. This would include Vegetarian, Vegan, Gluten Free, Nut Allergies, etc. This option does not cover gourmet or fully organic meal packages. We are in a continental or inland climate that varies greatly in temperatures and weather. On the Fall Semester temperatures range from +20 Celsius through early September to -25 Celsius in late November and early December. Snow starts falling in mid to late October. We can, however, get early mountain snow storms in September. On the Spring Semester the temperatures in March can be down to -20 Celsius and gradually warming to summer like days in June. Snow storms switch to rain about mid April. Bottom line is to be prepared for every type of mountain weather imaginable. There are several outdoor stores in the area from which you can buy gear and clothing during the Semester. Valhalla Pure Outfitters and Vertical Addiction (both in Canmore) offer students a 10% discount. Request an MSS Package here. Before applying for the Semester you need to open and read the Semester Application Form and Booking and Cancellation Policies. This outlines the payment and enrollment process. You will need to download this form, complete it and return it to us (mail or fax), even if you book on-line or by phone. Minimum enrollment is 6 students, an amended program may be offered should enrollment be less. $300 refundable gear damage deposit required from all students. Tax Receipt issued for tuition costs. Ski Ability – you need to be an intermediate skier/boarder able to link together parallel turns down most intermediate slopes at the ski hill. Age restriction – students must be at least 18 years old for our Spring semester and 19 years old for our Fall semester. You can apply for this semester by calling us or on-line by using the button below. Along with all relevant receipts we will send you a full trip logistical kit (containing meeting times, a list of what to bring and info on how to get here) and a sample copy of our waiver (see sample waiver) which we will ask you to sign when you meet us. Following interim acceptance of your application you will also need to download the applicant questionnaire for you to fill in and our medical form to complete. Return both by fax or mail. For all your travel insurance requirements we recommend the Simpson Group. This agency offers a wide range of travel insurance options including Trip Cancellation/Interruption, Travel Medical and Personal Effect Loss for Canadian and International Travelers. We highly recommend purchasing this insurance. Minimum enrolment is 6 students, an amended program may be offered should enrollment be less. The Mountain Skills Semester is dedicated to excellence and committed to delivering the technical proficiency required for students to become competent and safety conscious mountain travellers. Technical mountain skills coupled with an opportunity to experience personal growth and challenge through mountain sport is the foundation of the semester. This intensive experience of learning and living in the mountains with a dedicated group of like-minded individuals will lead to a lifetime of opportunities both recreationally and professionally. PLEASE DON’T HESITATE TO CONTACT US IF YOU NEED TO KNOW MORE ABOUT THIS COURSE!